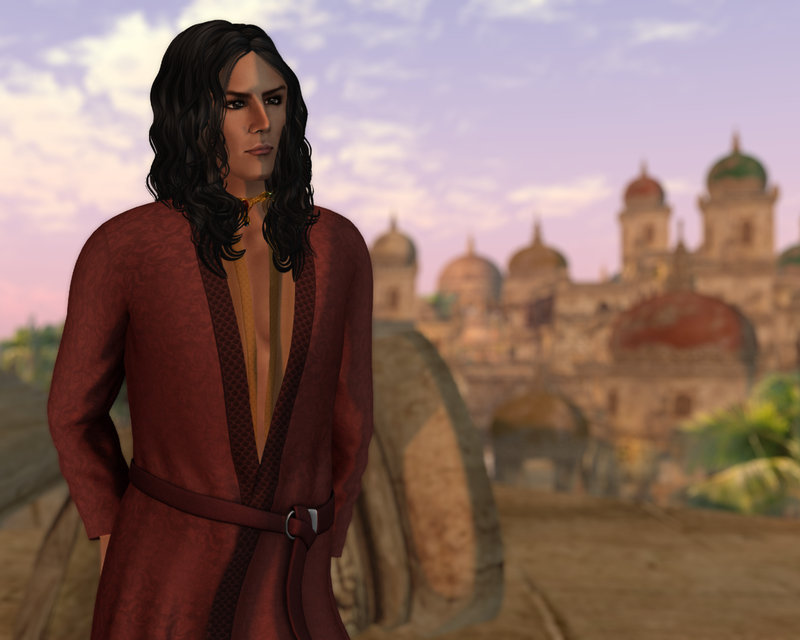 While I don’t roleplay in Second Life (instead, you’ll find me on Blood of Dragons MUSH), I am most definitely a roleplayer. I also like capturing what you might call “roleplay situations” in my fantasy blogging and I often find myself frustrated by the lack of poses for such scenarios. Enter the Roleplay HUD from Mythril, which offers a wonderful variety of poses and animations for roleplayers and photographers looking for something different. In addition to the HUD, I also showcase Wasabi’s two new hairs for the Fantasy Faire as well as a neat outfit from Stitched. While many of you are celebrating Christmas, the 25th of December is the second laziest day of the year in Sweden, with most everyone recovering from food-induced coma after eating way too much Christmas food on the 24th as we celebrate on the eve rather than the day. This left me with plenty of time free today (leftovers for dinner, yay) and after visiting the stables where I ride I decided to continue with the horse theme in Second Life to review three of the five new full body mods for the Teegle Bento Horse Avatar; the Baroque Horse mod, the Light Horse mod and the Pony mod. Please note that you do need to own the base avatar to use these body mods. I had also planned to review the Spanish Walk and Spanish Trot from Teegle, but I wasn’t able to get these working with the riding system, only with the horse moving on its own. I just haven’t messed around enough with the AO to know whether this is something you can work around or not, but since the horse is more geared towards being used as a stand-alone avatar as opposed to a riding horse, some things don’t work when it is being ridden. Anyway, what I have for you today is a campsite from Roawenwood, a harness from Noble Creations and a pair of very useful applier tights from Stitched—for both male and female avatars, yay. As you can see, I am “Frey” today, wearing a new group gift skin from 7 Deadly Skins on my LightStar head. Today is all about two gacha sets, one from the Fantasy Gacha Carnival and one from the upcoming round of the Arcade. Both of them are of course extra nice with all the pieces present, but they are not gachas that depend on you collecting everything to have a usable set. This one is almost all about We Love Role-Play, which underscores what a great round the current one is. And not just for the girls as there’s definitely some nice things for the guys available as well, as evidenced by Ran’s presence in these photos. It is that wondrous time of the year again when the Fantasy Faire has opened and the Fairelands can once again be reached. This year the Fairelands consist of no less than 14 sims of shopping and entertainment. Each sim has a different builder and a different theme, offering different looks at the Fairelands. And, most importantly, the Fantasy Faire is an RFL event with all vendors offering RFL exclusives. My first stop at the Fairelands this year will be the Golden Delta, built by the always amazing Alia Baroque of Fallen Gods and Libertine. Yesterday, we showed you a few glimpses of the Fairelands for this year’s Fantasy Faire. Today, we have let the Muses inspire us to stage a feast in the woods. Titania is your hostess and she’s bedecked in jewellery from the Plastik and hair from Analog Dog, while her handsome knight wears garments by Stitched and hair by Wasabi Pills. After a long period of not finding much of interest to buy, I was reminded that Stitched has a number of excellent outfits for men, aimed at the roleplay market. And so I dived in with one of their latest releases, Aidyn. 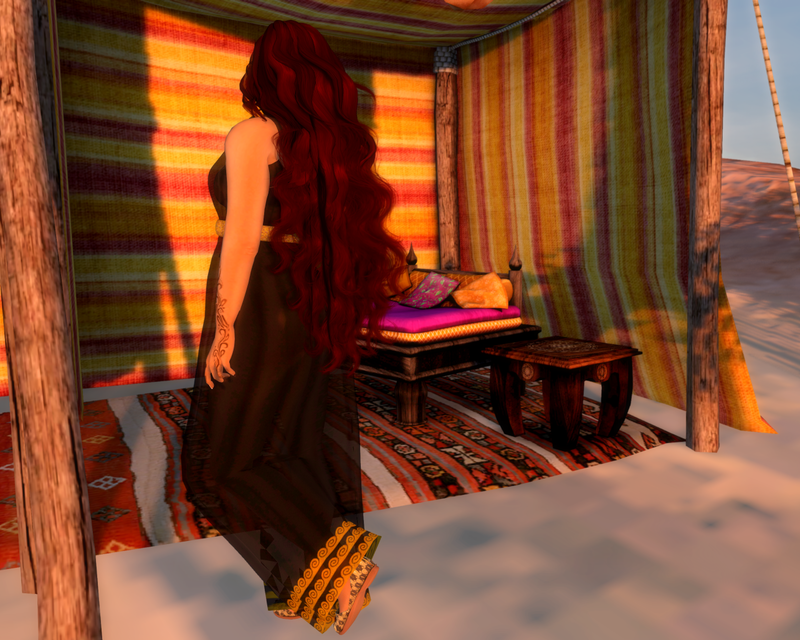 Its Midsummer here today, but for my blogging I am abandoning Swedish traditions and heading out into the desert courtesy of the latest round of Genre - Arabia. I also added in a dash of Totally Top Shelf, a new event where the first round is inspired by Greek mythology.